still use the disc format despite the growing popularity of online movies. Am I missing something here? Of course there’s an outcry from customers who still — still! — use prehistoric disc technology. I’ve been a Netflix customer for about a year, ever since the last DVD rental place around here pulled up stakes, and the reason I still rent discs is because the selection of streaming movies on Netflix is pathetic. At a guess, I’d say that when I go to look for a title, it’s available in streaming format about 10% of the time. The other 90% of the time I have no choice but to get the disc. 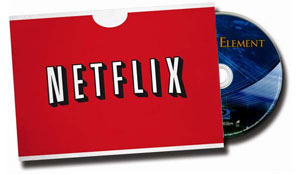 So how can anyone, least of all Netflix themselves, supposedly be surprised that discs remain popular? Again, am I missing something here? On a related topic, this is a crappy way to treat customers. When I signed up for Netflix, I remember thinking that they were just trying to lure customers in with a low price that would suddenly jump when enough people had gotten used to the service and would either (a) not notice the price hike or (b) just shrug and keep their subscriptions due to inertia. But I confess that it never occurred to me that Netflix would suddenly jack up their price 60%. Credit for moxie, I guess. On the other hand, I imagine it’s going to work great. They’ll get some griping and some cancellations, but nowhere near enough to eat into the higher revenue from the price hike. Whether they’ll continue to grow at a decent clip at this new price point is another question. UPDATE: Interesting comments. The most common is that I shouldn’t be blaming Netflix, I should be blaming the studios, who are in the process of jacking up their contract demands in order to get their hands on a bigger piece of the distribution pie.